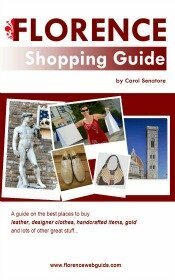 Want to buy handmade leather bags and goods in Florence? You've come to the right place to find the best insider tips on where to go! Leather workshops - where the goods are produced and sold in the same location - are a real treat to visit and shop in. Shops like these let you experience the artistic traditions that Florence is so famous for first hand. Soak up the atmosphere while watching leather workers make their handcrafted leather goods following the artisan heritage which has been passed down from generation to generation. The workshop-shops listed below produce handmade leather bags and goods at reasonable prices (things cost less too because there's no 'middle-man'!). This type of family-run leather production is getting rarer and rarer. 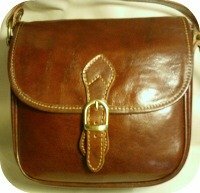 You can buy good quality hand-made Italian designed leather bags, wallets and belts at extremely reasonable prices. 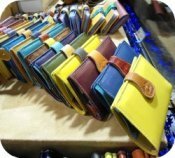 This Florentine family (in the business for 60 years and three generations) especially like working with fun colors, making bags and wallets in lots of bright hues (see below) as well as the classic tan (see above) and black leather. 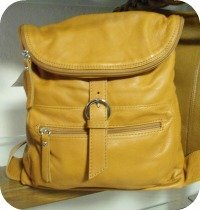 The shop sells bags of all sizes and types, wallets, briefcases, make-up pouches, belts, key chains and other small items. Gift ideas in leather starting at €5, wallets starting at €20, bags at €35. Giuseppe Fanara has been working in Florence for over 20 years (that's him working at the top of this page!). 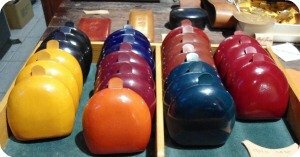 His shop/workshop sells the popular Florentine coin case, card holders, glass cases, and other small items. In the shop you can see Giuseppe at work amidst pieces of rawhide leather, oils and dyes. 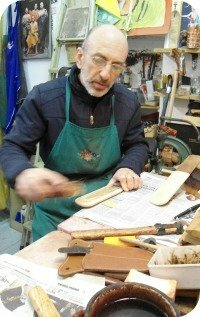 His workmanship is sought out: Armani and Moschino – among other important labels - have commissioned him to produce leather products to be sold under their name (see scrapbook in store with other designer commissions). The coin case, known as il tacco (the heel), is by far the most popular item (pic above). This typical Florence coin carrier – made by molding the leather with water (there are no stitches at all) - is an ingenious work. The case is small and light to fit in your pocket without being bulky (it’s used more by men than women) and, although it’s tiny, it holds lots of change, which – when opened – comes spilling out into its own ‘cup’, which folds back into itself when you close it up. This is a way to carry change with a real touch of class, and a fantastic gift idea too (can be hand-branded with initials for a personal touch). Tacchi start at €34. small items and gift ideas under €20. This shop looks more like a workshop than a store, the goods are stacked here and there on shelves and hooks while in the middle the work is carried out. Dantesca is in the heart of the historic downtown area and is a place where you can see workers creating the leather goods while you browse. This shop is located in the oldest part of the downtown area and is near the XIV century tower of the Pagliazza which can be found in the nearby small square, piazza Sant'Elisabetta. 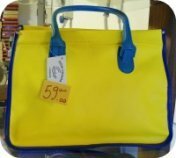 Dantesca has very good prices on a large selection of handbags as well as many other leather goods. Medium sized handbags go for about €40 – 50.